Still have questions about how everything works? Just take a look at our frequently asked quesitons and answers. We cover absolutely everything. And if you still have questions? Shoot us an email, and we will get you squared away. John is a great customer of yours. So let's thank John for his business. For being such a great customer, you give John a Nift gift card. John is super excited and thanks you. A Nift gift card will help John discover another great local business in the area. John goes online to see what gifts he can choose from. He is really excited. To redeem a Nift card, John goes to www.nift.me and inputs the code found on the back of the card you gave him. 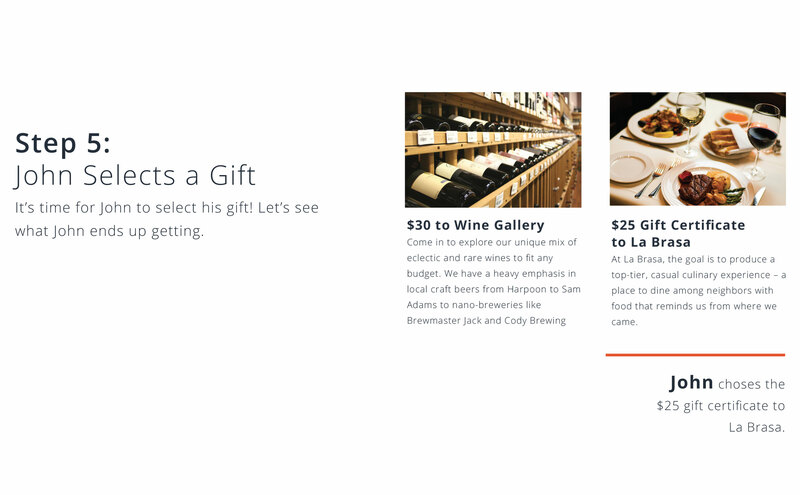 Before he can select his gift, John is asked to fill out some basic information so Nift can match him with the best two gift options in his area. Only one more step separates John from his gift. Here John can tell us what he likes before we present him with two gift options. Turns out, John loves great wine and good food. It's time for John to select his gift! Let's see what John ends up getting. John will get an email with a mobile gift certificate. He'll have a few weeks to redeem his gift at La Brasa. Step 7: Review. Share. Return. After John visits La Brasa, he will have a chance to offer you feedback on his experience. John will also be able to share his experience on Facebook, Twitter and Instagram. Step 8: Others give gifts, too. When you give gifts, you're helping to grow the network. At the same time, other Nift businesses in your area are giving gifts to help bring new customers through your door. Lucy received a Nift gift from another local business. She had two different gift options to choose from and chose yours. The gift certifcate will be sent to her phone. She'll use it to redeem the gift at your store. Step 9: Lucy Comes to Your Store. With the gift certificate on her phone, Lucy is ready to come in and try your store. 1.Click the Redeem In Store button. 2. Enter the bill amount and click Got it. 3.Credit the full Nift gift certificate value at the register and tell your new customer you look forward to their business again. Sometimes your new customer will forget how to find their certificate. 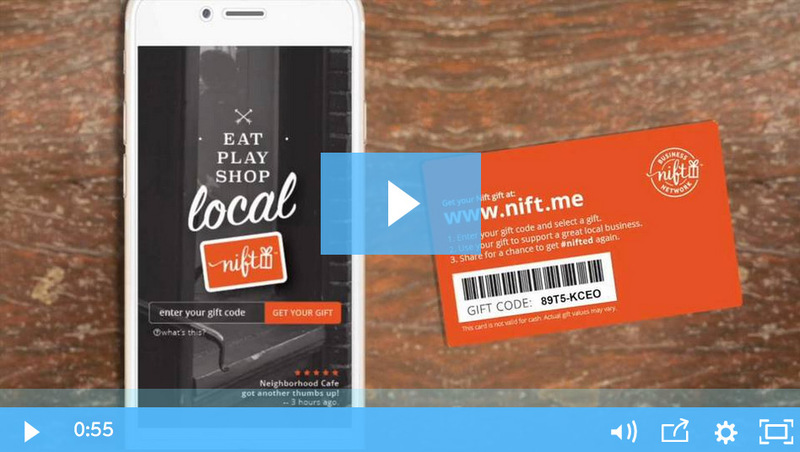 If it can't be found on their phone simply log in to your Nift business account, click the redeem icon, and then find their name and click the blue redeem button. After a customer comes in to your store to redeem their certificate, you'll be asked to rate them. Nift is about helping great customers discover and support local businesses. So if a customer consistently gets bad ratings, they will be removed from the network. You just gave your customer a great gift and had a new customer come in to experience your awesome business! Now do it for real. Sign up to join a neighborhood network today.